QLD police service allowing corporate sponsorship is the canary in the coal mine we all need to look out for. The very fact he has to reassure the public “no preferential treatment” will happen reveals they know full well what the implications of this sponsorship could mean. When we open this door of allowing our public services to start to accept sponsorship, it opens the door to eventually depending on corporate sponsorship. If so how can it not influence how police approach one group or another? In and of itself, maybe this kind of sponsorship is relatively benign. It’s the slippery slope it oils that is the problem, and something of which we should all be extremely wary. Democracies don’t turn into corrupt oligarchies overnight; rather, it happens by stealth, little by little, one small compromise here and another there. From day to day, not much is different, but over years our democracy can be hollowed out. A recent study done by Princeton University in the USA shows how this is already a reality. Australia can’t be too far behind. Make no mistake, those with power want more, and when they get it they do not let go. In the comments section of the linked article a former Police Officer articulates the problem very well. GARY: As an ex Qld Police Officer, I find this so very wrong and disturbing. There is major conflict when QPS police are called upon to arrest those at the gates at Santos projects. Santos is simply trying to gain credibility in associating with a legitimate government agency. 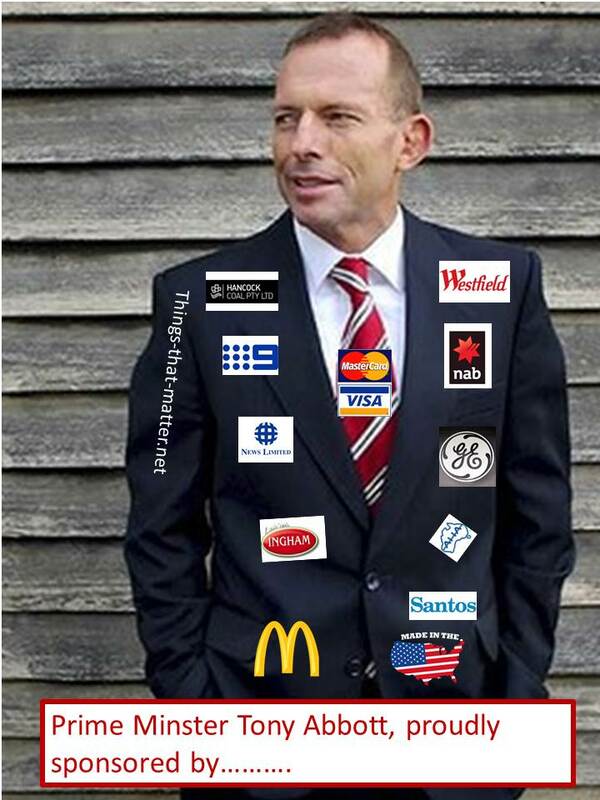 Santos needs the credibility as they are doing so much damage. It creates a very bad image in that any police action such as arrest or detention in being done so on behalf of Santos. I can only see such irresponsible sponsoring as a major conflict of interest.Will the QPS next have sponsorship from legal brothels on the side door or even that naughty Xbox game Grand Theft Auto 5.This Santos sponsorship is so wrong. There is a broad agenda across the world that aims to privatise everything, basically ridding the landscape of democracy and making the world one big business in which money equate with power, rather than votes. Already in the UK there is talk of privatising the police. The sale of the NHS to Tory donors is already underway, as there are no more sacred cows undeserving of being monetised and sold off. This agenda is in full stride as austerity in the US and Europe paves the way with a fire sale of state assets to the corporate vultures that circles, waiting to pick at the bones of public wealth. The financial crash of 2008 created by our banking industry has been lumped onto the public. Corporate welfare is available for the rich, harsh and unrelenting austerity for the rest of us. As described in Naomi Klein’s book “Shock Doctrine,” in the shock of the crash, right beneath our eyes the largest distribution of wealth from the poor and middle class to the small elite happened and continues to happen, without anyone even blinking an eye. So we end up in a democracy where certain people can swindles billions of people’s life savings without any criminal repercussion, but if you steal a bottle of water you go to jail for 6 months. Of course, the outrage in the media is nowhere to be found, as it turns out they are owned indirectly by the very same criminals who masterminded the swindle. This isn’t some shadowy conspiracy theory, rather just the reality of letting an economic system driven by greed and control let loose unchecked and unrestrained. Australia is in just as in much danger as anywhere else. Therefore, we must be vigilant and protect our rights, our democracy and our power as citizens who own this country. 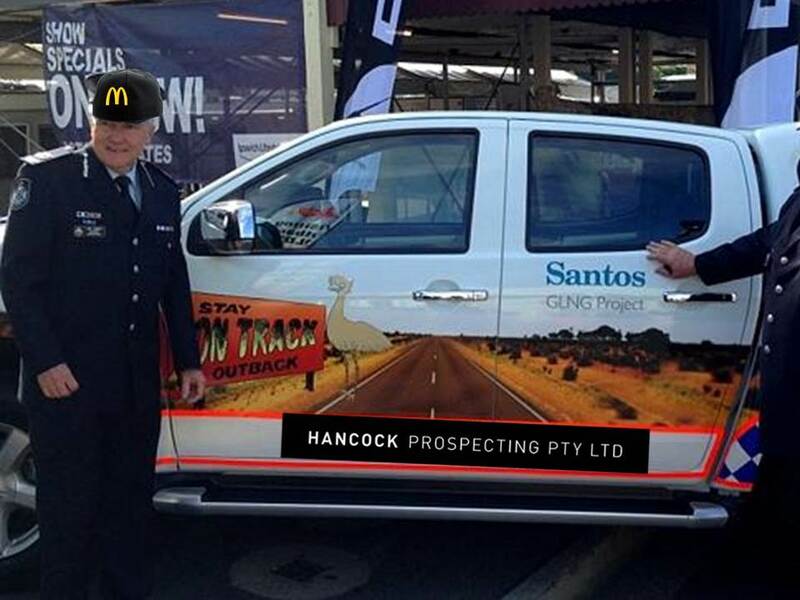 Corporate sponsorship of the police services is exactly the type of canary in the coal mine for which we need to look out, and this needs to happen before our government’s spineless and craven politicians become totally bought, and companies like Santos no longer sponsor the police services, but own them outright. I read the study which was linked into the article and feel that they have a point. Hmmm this may have actual grounds for being inappropriate. It would be good to hear a better understanding of the other side to see why this has been seen as appropriate. Hi Tilly, Which study are you talking about, the Princeton one on the US becoming a plutocracy? Sorry just trying to understand your question. Santos is not the only sponsor of this wonderful safety programme and I don’t see you mentioning that it is a bad thing that they take sponsorship from them. This appears to be bias propaganda on your behave. All of the sponsorship is openly advertised on their vehicles so there is no under-handed donation going on. Without these company’s sponsorship this safety program probably would not exist as it is an extra service.